This class is essential for exclusively expressing breastmilk or returning to work and planning on pumping. This class is to be taken prenatally for exclusive pumping; or at least 4 weeks prior to returning to work. 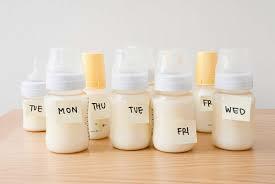 This class will cover strategies to properly express, store and manage your breastmilk supply. We will cover the basics of pumping, the importance of a routine, communicating with caregivers, avoiding pitfalls such as having too little milk stored and declining milk supply, understanding "reverse cycling" and other behaviors by the baby adjusting to separation, how to introduce solids while protecting supply and much more. Each class participant will leave with a customized pumping plan for their work/life schedule, the amount they should have stored in the freezer and specific strategies for managing their breastfeeding/pumping relationship. This 2.5hr class is $75 and is taught by Jenn Sullivan, CBS. A non-refundable deposit of $20 is required to hold your spot for the class. Payment can be made below or by dropping cash or check. To register or for more information, contact Jenn Sullivan, CBS via email flowbreast@gmail.com or by text at 845-240-8399.